Atrial fibrillation, an irregular, rapid heart rhythm, affects over 2.3 million Americans, with an annual incidence of 160,000. More than half of patients with atrial fibrillation suffer from fatigue, shortness of breath and chest palpitations. Many patients can be treated successfully with medication that thins their blood, reducing the risk of blood clots, and with drugs designed to regulate the heart rate. In more than 500,000 cases, medical therapy is not effective, leaving patients at risk for stroke and heart failure. Thankfully, new surgical techniques exist that can correct the problem, giving patients a better prognosis. At the Montefiore Einstein Center for Heart and Vascular Care, a multidisciplinary team consisting of cardiologists, electrophysiologists and minimally invasive heart surgeons uses the latest surgical techniques to eliminate atrial fibrillation. By blocking the faulty electrical signals that cause atrial fibrillation and, when possible, removing the atrial appendage where clots form, our surgeons are able to cure the disease in most patients. Atrial fibrillation is caused by faulty electrical triggers coming from the pulmonary veins of the left atrium, resulting in wavelets of energy that establish an irregular and fast heart rate. In the heart, blood is pumped from the upper chambers, or atria, to the lower chambers, or ventricles, where it is then pumped out of the heart to the rest of the body. Two nodes in the heart coordinate the electrical impulses that regulate the split-second timing, allowing the atria to contract just before the ventricles. In the healthy heart, this electrical system runs like clockwork-one electrical impulse equals a single two-part heartbeat. In patients with atrial fibrillation, instead of the impulse traveling in an orderly fashion through the heart, many impulses begin and spread through the atria. These conflicting messages leave the lower heart unsure about how to process the electrical information it is receiving. The heart is unclear which message to forward to the atrioventricular node at the base of the right atrium, where the message to contract is passed on to the ventricles. Are there Different Kinds of Atrial Fibrillation? Atrial fibrillation is termed paroxysmal if it occurs intermittently and chronic or persistent if it occurs all the time. At the Montefiore Einstein Center for Heart and Vascular Care, our surgeons are experienced in treating both types of atrial fibrillation. Individualized treatment plans are developed for each patient, offering a range of medical options and surgical interventions. In patients with atrial fibrillation that is uncomplicated by forms of heart disease and who have normal-sized atrial chambers, the pulmonary veins can be electrically isolated from the rest of the heart with radiofrequency energy. Through vessels in the groin, the surgeon introduces two catheters into the heart and, guided by X-rays and electrical maps, creates what are called ablation lines-very precise, localized scarring that prevents abnormal electrical impulses from passing through. Anticoagulant medications must be continued to prevent clotting because the atrial appendage cannot be removed. In this procedure, the surgeon uses a telescope, special minimally invasive instruments, which are inserted through three small holes on either side of the chest cavity, and, in some cases, robotic assistance. The pulmonary veins are electrically isolated with either microwave energy or radio frequency energy applied to the outside of the heart. Multiple ablation lines are created, if needed, and the left atrial appendage is removed. Patients with paroxysmal atrial fibrillation are the best candidates for minimally invasive surgical ablation. In selected patients, anticoagulant medications can be eliminated. 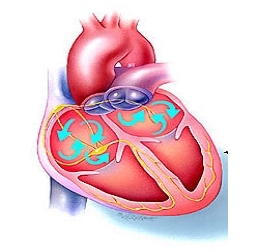 The Maze procedure is the most comprehensive surgery for the treatment of all types of atrial fibrillation. It is successful in 90 to 95 percent of patients. In this procedure, the heart must be stopped, which requires patients to be placed on a heart-lung machine for the duration of the surgery. With robotic assistance, the operation can be performed through a 5 cm incision between the ribs of the right chest cavity. The surgeon uses a combination of incisions and ablation lines, which are applied using radio frequency, microwave, or cryothermy or cold temperature energy. The localized scarring creates a maze-like network that blocks abnormal electrical impulses, while creating corridors where the appropriate electrical impulses can travel. In this way, communication between the nodes that control the heart rhythm is restored, and the heart returns to a normal beat. During the procedure, the left atrial appendage is also completely removed, eliminating the need for medication to prevent blood clots.